Caught between two worlds, McDowell’s Thril cola made an impact in India, but briefly. In 1977, India was left with a large void in the ‘cold drinks’ or carbonated drinks segment. American giant Coca Cola had just left the market over the Janata Party government’s insistence that the company reveal its recipe and comply with the Foreign Exchange Regulation Act. Soon after, a cohort of made-in-India beverages jumped in to capture the market space –but it was McDowell’s cola brand Thril that won the market for a while with its catchy punchline: “Hum, tum aur Thril gaye mera dil”. Between the 1970s and 1991, when Indian market was liberalised, several ‘desi’ drinks jostled for space like RimZim, Sprint, Duke, ThumsUp, Limca and Campa Cola. Even the Janata government launched its own cola brand: Double Seven. The name was taken from the year it defeated Indira Gandhi’s Congress. But most of these companies, like Thril, got stuck between two worlds and couldn’t make it out – some of them were bought by bigger MNCs after liberalisation, while others settled in the nooks of nostalgia. Thril was introduced in 1983 and soon after the company launched two other flavours – a clear lime-based beverage Sprint and the orange-flavoured Rush. Thril was fighting a tough competition with Parle’s ThumsUp, Limca and Gold Spot and Delhi-based Pure Drink’s Campa Cola and Campa Orange. Kisan Mehta, then head of McDowell’s food and beverage section told India Today in 1984: “Just as one tandoori chicken is much like another tandoori chicken, so one cola is much like another. The difference is in the extra twist you can add to the flavour and the package.” He had also complained about how the tax burden was preventing the cola from being sold at a cheaper price. “The market, at that time, was ruled by Campa Cola followed by ThumsUp. Thril was our third favourite and its tagline made us groove,” said Ajay Narang, a 51-year-old banking executive. From hiring a brand endorser to doling out attractive offers, industrialist Vijay Mallya’s company McDowell adopted every possible strategy to ensure the success of the brand. Thril actually launched Mallya into the spotlight. To compete with Campa Cola’s slogan “The Great Indian Taste” and ThumsUp’s “Taste The Thunder”, the company started promoting the brand as the “Space Age Cola”. 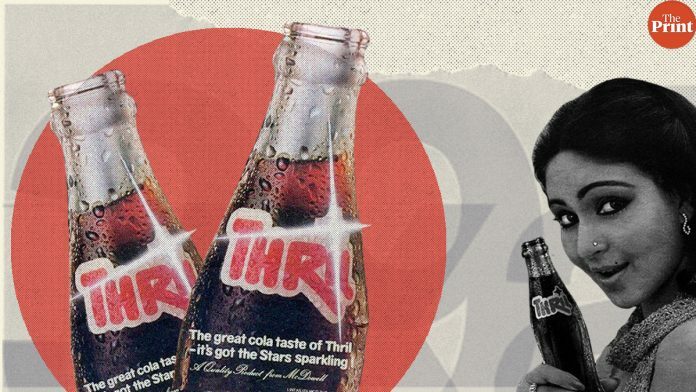 The ad further said, “The great cola taste of Thril – It’s got the Stars sparkling”. In the 1980s, the competition in the soft drink industry became so intense so that the beverage makers adopted aggressive advertisement and promotional strategies. While some soft drinks promised a free Maruti Deluxe Car, others offered tickets to the Olympic games, colour televisions and video games, according to a report. Thril promoted its brand by giving children free passes to the US Disneyland. Thril’s impact on the Indian market was brief. A paper by Indian Institute of Management, Bangalore in 1996, on ‘Brand Failures- Concepts and Causes’ used ‘Thril’ as a case study. According to it, the brand failed due to wrong positioning as the product was positioned as a “space-age drink”, which indicates a technologically advanced and a modern drink, but it was promoted only based on the glamour-factor of celebrities endorsing it. “The brand did not survive at a time even when the cola market was in its growth phase,” it noted. It was way behind its competitors. While McDowell’s managed to sell “anything between 3 million and 4 million cases”, the sales of Parle crossed “40 million mark in 1984 – eight times the 1976 turnover of 5 million”. The brand also bore the brunt of heavy excise duty in the price of a bottle. When the economy was liberalised in the 1990s, Coca Cola re-entered the market and most Indian soft drinks were slowly wiped out. However, it is not clear in which year the production of Thril cola was stopped. A mail sent to Mcdowell’s, now owned by British multinational company Diageo, did not fetch any response. This article will be updated if the company responds.